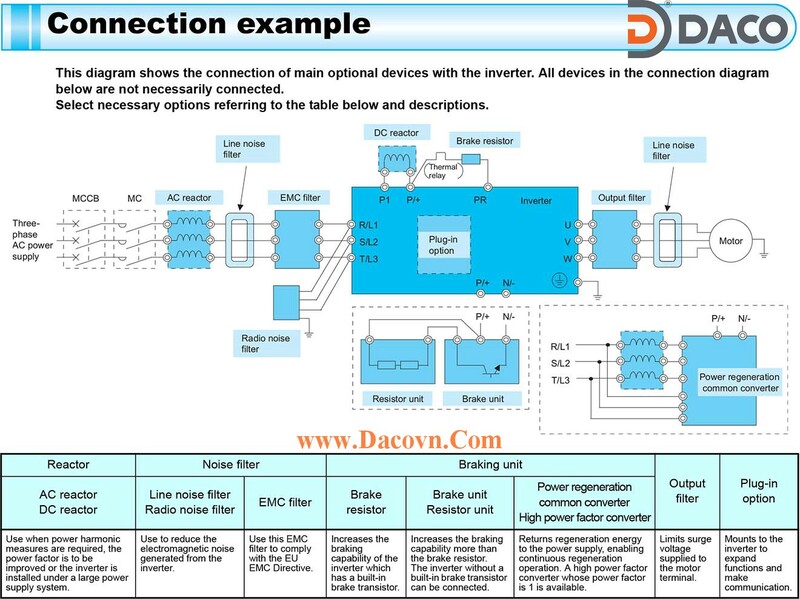 *1 PU connector is disabled for the FL remote communication model and the CC-Link communication model. *2 The option is not compatible with the FR-A800-GF. *3 The option is not compatible with the FR-A800-R2R. *4 FR Configurator is not compatible with FL remote communication models. *5 Only models with a built-in brake transistor can be used. *6 For the 200V class 0.2K or lower, 400V class 1.5K or lower, they cannot be used in combination with a brake unit. *7 For the 55K or lower, a corresponding appliance is built-in on the input side. *8 Filterpack (FR-BFP2) is enclosed for the FR-F70PJ-KF inverters. *9 The filter can be used under V/F control or Advanced magnetic flux vector control. *10 The filter cannot be used during IPM motor control. *11 The filter can be used under V/F control. *12 The option is compatible with the FR-E720-0.1K to 7.5K only. *13 The option is compatible with the models with the 3.7kW or lower capacity.